Today was a painful day for HPH Trust, it dropped by more than 7% from a high of 0.48 yesterday. Yesterday after market closes, the results came out. June 2017 throughput of HPH Trust’ deep-water ports was 5% above last year. YICT’ throughput was 4% above last year. 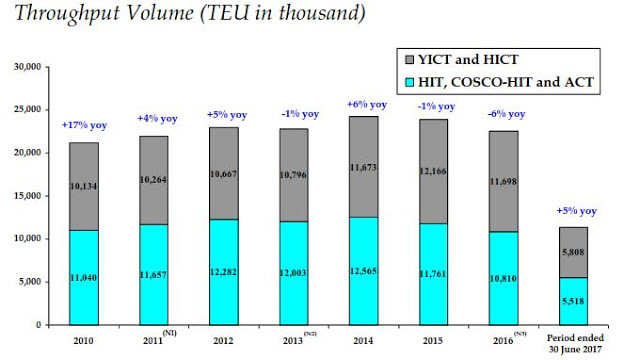 Combined throughput HIT, COSCO-HIT and ACT (collectively “HPHT Kwai Tsing”) increased 4% yoy. YICT’s throughput growth in the first six months of 2017 was mainly attributed to the growth in US and EU. The increase in HPHT Kwai Tsing’s throughput was largely due to stronger transhipment. However, Distribution Per Unit dropped to 9.5 HK cents from previous 14 HK cents. The high dividend yield is no longer sustainable. HPH Trust managers felt that freight rates are weak and shipping lines will continue to seek ways to reduce cost and become more efficient through the use of facilities and manpower synergy. Global trade is forecast to rebound in 2017, they felt this may be the bottom. From the figure, it seems to be painting a better picture in terms of throughput volume. So what went wrong? 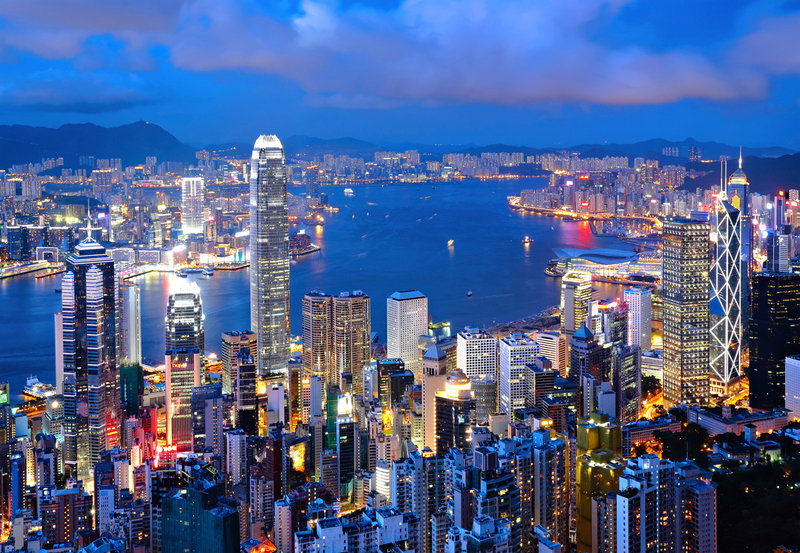 The Total Operating Expenses is reduced by 5% from 4,029 to 3,808 HKD million. The issues come from the Interest and other finance costs which was an increase of 17% from 346.4 to 403.9 HKD million. This is primarily due to HIBOR/LIBOR applied on the bank loans’ interest rates. Share of profit/losses after tax of Associated Cos/JV is negative 15.3 HKD million. This reflect the share of HICT’s result following the completion of the acquisition by HPH Trust at the end of 2016. Taxation was higher than last year due to increase of YICT Phase III Expansion and West Port Phase I’s tax rates following the expiry of their tax exemption period, but was partially offset by lower profit and tax savings from YICT Phase I & II as it qualified as “High and New Technology Enterprise” in November 2016, which entitles YICT Phase I & II to a preferential corporate income tax from 2016 to 2018. Total Operating Profit was HKD 1663.9 million, HKD 425.9 million or 20.4% below last year. Overall, profit and profit attributable to unitholders of HPH Trust was HKD 937.6 million and HKD 436 million respectively. 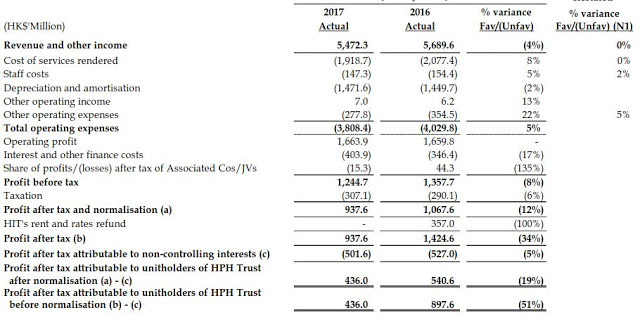 Excluding HIT’s rent and rates refund in 2016, profit was HKD 130 million or 12.2% below last year and profit attributable to HPH Trust was HK 104.6 million or 19.3% below last year. From the above figure, there is one positive sign which is stronger free cash flow of HKD 1,206 million as compared to HKD 607.8 million for 2016 Q2. Overall HPH Trust is producing positive Operating Cash Flow and increasing free cash flow. I see this as a positive sign unless the company is trying to delay CAPEX. 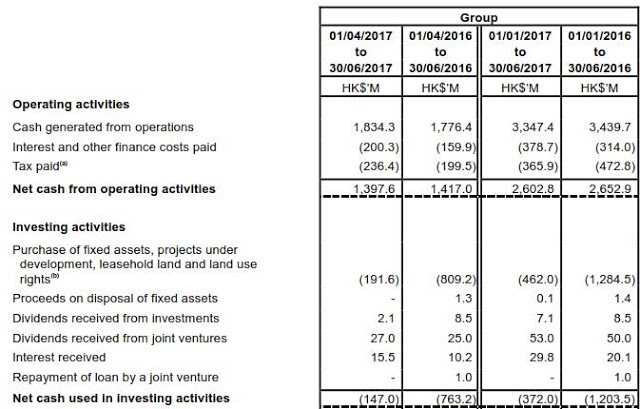 The notes explain that purchase of fixed asset, projects under development, leasehold land and land use right were HKD 462 million for the period ended 30 June 2017 whereas it was HKD 1,284.5 million for the period ended 30 June 2016. The decrease was mainly due to the capital expenditures incurred for West Port Phase II Project in 2016. All the negative results cause the big reaction by shareholders today. Shareholders are punishing the stock. I queued at USD 0.47/share to clear half of my holdings but I was too slow to amend to USD 0.46/share. Then it plunges to USD 0.445/share by noon time. 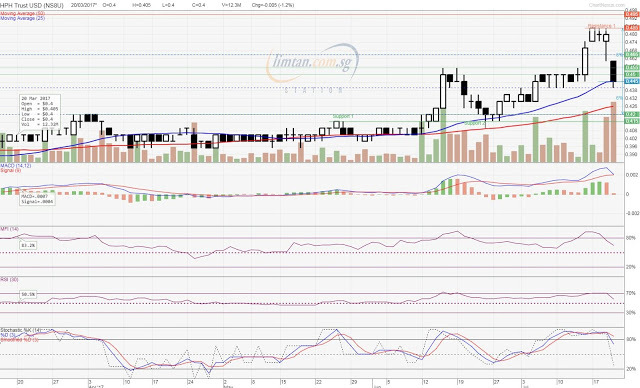 Let’s wait a while but I am quite sure it will drop to USD 0.4/share in the short term and recover over time.